Do you have a question for me? I look forward to hearing from you with any questions you may have. Please use the form below to enter your questions or use the links to navigate to another part of the website. Thank you! Q: How do I learn more about your skincare line? A: You can contact Murad Skincare directly at 1-888-686-8723, online at Murad.com, or on our site here. Q: How can I get help finding a place for my parent or loved one to live? A: You can contact A Place for Mom directly at 1-866-344-8005, or online at APlaceForMom.com. Q: How can I find more information about Camp Reveille? A: We are so glad you are interested in more information. You can get more information about Camp Reveille on our site by visiting: Camp Reveille. 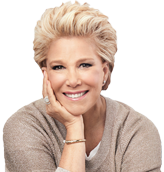 Q: Can I get an autographed picture of Joan Lunden? A: I would love to send you an autographed photo. Please fill out the contact form with this request and we will be in touch. Thank you. Q: How can I get Joan to speak at my event? A: I always love to stay busy and try new things. If you would like me to speak at your next event please visit Book Joan to see my speech topics and request a speaking date.